Let me start this article with a picture. Take a look at the image below. If you thought that this was a shot straight from the Lord of The Rings movies than you would be wrong. If you thought this an abstract wallpaper image created in Photoshop then you would be wrong again. 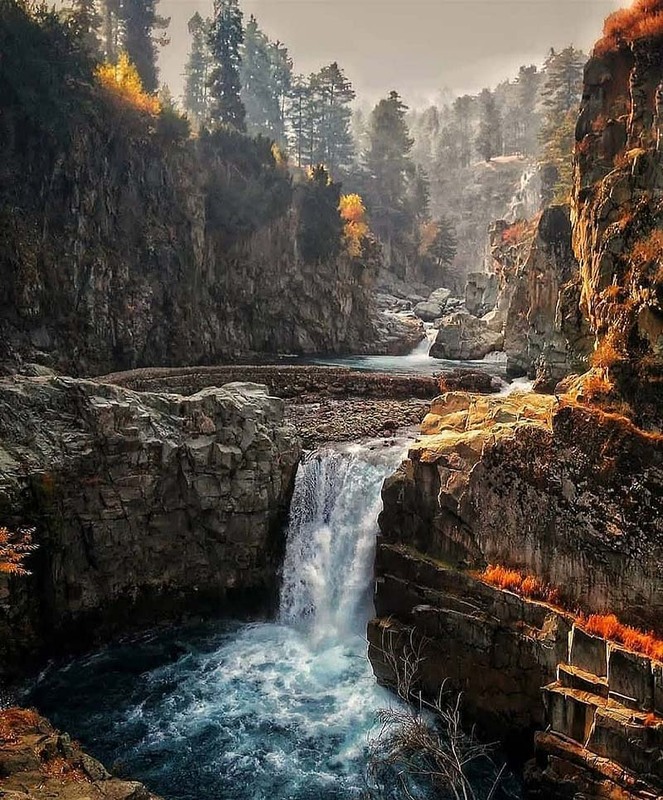 This actually is an image of Aharbal Waterfall in Kashmir; also fondly known as Niagara Falls of Kashmir. I agree that the image below is slightly edited with a bit of red tint to it but the actual place is not much different either. This photograph was clicked during Autumn season in October when all the vegetation turns orange. At the time of sunrise or sunset, when the sunlight too turns a bit orange and falls on the waterfall, you get presented by this charmingly beautiful sight. For a brief introduction, Aharbal is a hill station in the south-western part of Kashmir Valley; located about 70 kilometers south of Srinagar. The place is known most for its spectacular waterfall which in recent times has started to get referred to as the Niagara Falls of Kashmir; owing to the volume of the water that falls. The waterfall is formed when Veshaw River or Nallah Veshaw falls noisily 25 meters and 7 meters through a narrow gorge of granite boulders. The place is quite peaceful and suitable for expeditions, trekking, photography fishing etc. (Source Wiki). If you are planning on visiting Kashmir anytime soon, then I highly recommend making Aharbal a part of your itinerary. How you can plan a trip here is what I will be discussing in this article. Let me first start with the why part. I recently traveled to Aharbal myself and while I was standing at the waterfall, clicking pictures; the only thought running through my head was about how crowded the place would have been if it was located somewhere in Uttarakhand or Himachal. It reminded me a bit of Kempty Falls of Mussorie but is not yet destroyed by all the tourist rush and commercialization of the place. It is like those scenic spots that you see in the movies. A scenic spot with a beautiful waterfall in the background, silence all around except for the sound of the falling water. Thousands of people travel through Kashmir each year but only a handful of those come to Aharbal. It is a place that is still known only among the locals; as a picnic spot that they come to with their families. So if you want to visit some offbeat but highly scenic destinations then Aharbal is what I will recommend. The place is barely 70 kilometers from Srinagar and a to and fro journey can easily be done in about 5 to 6 hours. The Mughal road too kind of falls on the way so you can also include that in your plan. Start early from Srinagar, visit Aharbal, then take a drive on Mughal road till Peer ki Gali and be back in Srinagar by evening. If you started by 6 from Srinagar then you can actually cover all of Mughal road till Bafliaz. Is Aharbal Waterfall Safe to Visit? Next I will address the question that comes to everyone’s mind while thinking of visiting anywhere in Kashmir. How safe is it to go to Aharbal? I will admit that the road to the waterfall does pass through Shopian and one of the most volatile areas of the valley. But from a tourist’s point of view, it is completely safe to go. Do your homework first and make sure there is nothing in news about any unrest in the area; or of any ongoing encounter. If everything is peaceful then you are OK to go. No one here will mistreat or threaten you. As a tourist, you will be talked to with much interest as a matter of fact. I have covered the topic of tourist safety in Kashmir in another article, Is Kashmir Safe for Tourists to Travel To? Take a look at this page for more details; and a few tips on how you can ensure that your trip to Kashmir is safe and hassle free. How to reach Aharbal Waterfall? In order to reach Aharbal, you will first have to reach Srinagar of course which is fairly easy. For people coming by their own vehicle, you can just drive to Srinagar city by either the regular Jammu – Srinagar highway NH44; or the Mughal road through Rajouri – Peer Ki Gali – Shopian; also known as NH44a. I have covered the topic of reaching Srinagar in details at this post; How to Plan a Trip to Srinagar; which I will recommend reading to get more information on both these routes. Once you have reached Srinagar, you can then make a road trip to Aharbal; which is a 2 to 3 hours’ drive at most, covering a distance of about 65 to 70 kilometers. If you were however not traveling by your own vehicle, then Srinagar is well connected to rest of the country by Air, Train and Bus service. No matter which part of the country you live in, you can easily reach the city by either flying or boarding a train. You will then either have to rent a motorcycle or taxi from Srinagar or board a bus / shared cab for Aharbal. How far is Aharbal from Srinagar? Aharbal is at a distance of about 70 kilometers from Srinagar. But this will also depend on where in Srinagar you are starting from. If you were starting from somewhere close to Dal Lake, like Nishat Bagh or Shalimar Bagh then the distance would be around 75 kilometers. How to reach Aharbal Falls from Srinagar? After you have arrived in Srinagar, getting to Aharbal is not that difficult. The route of the journey will be as mentioned below; if you were traveling by your own vehicle or a rented cab / motorcycle. You can take either of these routes and they are about the same distance and equal travel time. In terms of distance and travel time, both of these routes are the same. The only different however is that in the first one, you travel through some interior parts of Kashmir which is actually fun. In the second part, for the first 15 kilometers or so, you travel on the Jammu – Srinagar highway and then take a turn towards Shopian. The total distance would be about 70 kilometers but it is only the last 15 kilometers of the journey which is a steep climb. For the remaining 50 odd kilometers, the road mostly remains flat and you will find it hard to believe that you are actually traveling through hilly areas. With all the greenery, plantations and Muslim majority areas, it actually feels like traveling through towns of western UP and not Kashmir really. If you were reaching Aharbal from any other part of Kashmir, like Gulmarg, then the idea is to reach Shopian. Just ask around and take the road towards Shopian and from there, you can take the 15 kilometers long uphill climb to Aharbal Falls. The best, easiest and most convenient way would be to rent a private taxi for the trip. Depending on the type of cab you chose, your total charge for the day would come out to be between Rs. 2000 to Rs. 2500 per day; including fuel and driver. You can either look for a taxi at Taxi stand in Srinagar after you reached there or book one in advance. Both options are OK but booking in advance would be better because then the drive can pick you straight from your hotel. For renting a private cab; talk to Faisal in Srinagar at 9596410670. He is a great guy and will be able to get you a cab for the lowest possible price. It would depend on which cab you chose. For an SUV like Scorpio or Innova, expect the per day fare to be around Rs. 2,500 including fuel and driver. If you chose a hatchback like Etios, this charge would then be around Rs. 1800 to Rs. 2000. Now this is where it gets a little tricky. For budget travelers, I would still recommend a private taxi if you were traveling in a group; and can share the cost among 5 to 6 people. If you were however traveling solo then you can look for a shared cab as well; which in Kashmir is mostly a Sumo. Problem however is that it will not be easy to find. As I mentioned, Aharbal is not yet that famous among tourists. Not many people come in this direction due to which frequency of public transport to Aharbal is very less. Good news however is that Shopian is a major and well known town and lots of people travel till here. Your best bet of finding a shared taxi is from the Tourist taxi stand near Nehru park of the main Srinagar Bus stand. Finding a shared cab straight for Aharbal will be a one in a million bet but you will easily be able to find one for Shopian. If not then try to look one for any of the places that I mentioned in the routes above. Once you reach Shopian, ask around and you will be able to find a shared cab going towards Aharbal. If not then you may even have to hitchhike. Like shared cabs, traveling by Bus is not going to be easy either. There is no direct bus from Srinagar to Aharbal; and the journey would have to be completed in parts. Your first task would be to reach Lal Chowk in Srinagar and catch a bus for Shopian. This will not be that difficult because Shopian is a major town and there are daily buses from Srinagar to Shopian. Problem however then is reaching Aharbal from Shopian. There is no bus service available so you will be completely relying on shared cabs. Just reach Shopian Bus stand and ask around and you will be able to find a Sumo going towards Aharbal. Srinagar Airport is the nearest airport to Aharbal. It is located about 65 kilometers from Aharbal and the journey can be completed in about 3 hours. The major airlines operating regular flights to Srinagar are Air India, Jet Airways, Spice Jet, Air Asia, and Indigo. Srinagar railway station is the nearest railway line to Aharbal. Problem however is that it is not yet fully operational and connected. At the time of writing this article; it will take at least another 18 months to 2 years for a full connectivity. Right now, you can reach till Udhampur by train. From Udhampur, you will then have to board a bus or taxi for Ramban. After reaching Ramban, you will then board another train from Ramban to Srinagar. An easier way thus would be to just board a bus or shared taxi directly from Udhampur to Srinagar. Does the waterfall freezes over in winter is what I was asked by someone. The answer is that no it does not. Even during peak winter, when there is plenty of snow all around, there is still water flowing in the river and the waterfall will still be alive. However, If you were visiting Kashmir in winter season then I would recommend that you ask around about the road conditions ahead before heading towards Aharbal. It is very rare but sometimes, due to heavy snowfall, the road may get closed. Road until Shopian remains open throughout the year but the last 15 kilometers of stretch from Shopian to Aharbal may get blocked by snow. Due to its high altitude, weather of Aharbal mostly remains pleasant throughout the year. The region receives snowfall during the months of January and February and the temperature dips below 0 degrees Celsius at night. Snow starts to melt in March; and weather turns to more of a pleasant cold than harsh cold. Spring arrives in April and the area gets covered with a green carpet of grass. From April to June is considered to be among the best of times to plan a visit to Aharbal. Monsoon arrives in July and it can rain here anytime; though the amount of rain it receives is not that much. August and early September once again see lush green all around after Monsoon has passed. Cold starts to settle in again towards end of September; and by November, it can snow here anytime. Anytime from April till October is good for visiting the waterfall. You can go there in later months of November and December as well but then the vistas are a bit too dull; and the weather will be too cold. If you wanted to see the waterfall with a bit of snow around then try planning a trip in the month of February. You do not need to pack anything special just for Aharbal and whatever you brought for your Kashmir trip will do just fine. The place is a bit high in altitude due to which, it is always a bit cold here. In the months of winter, from October till March, you will need all heavy woolens with windproof jackets to protect you from the cold. During spring or summer season however, your regular cottons will do just fine. Even wearing a light jacket here from May till August will start to feel warm after a bit of walking around. Also Read: Srinagar – How to Plan your Trip and Explore? What to See at Aharbal? The waterfall here is the biggest attraction and this is what people come here to see. There really isn’t much else to do for a day’s trip unless you were planning a stay here for a day or two. In that case, you can then trek to the famous Kausar Nag Lake but for that, you will have to bring proper camping gear and guides from Srinagar itself. It is a 2 days trek from Aharbal so you will definitely have to come prepared with some time in hand. The natural beauty of the place around Aharbal is another attraction. The drive from Shopian till Aharbal is quite a scenic once with great vistas all around. As you get closer to Aharbal and see the Veshaw River flowing through the mountains, you will immediately take your camera out and start clicking. Another place to see near Aharbal will be the famous Mughal road. It is a stretch of about 85 kilometers running from Shopian to Bafliaz. 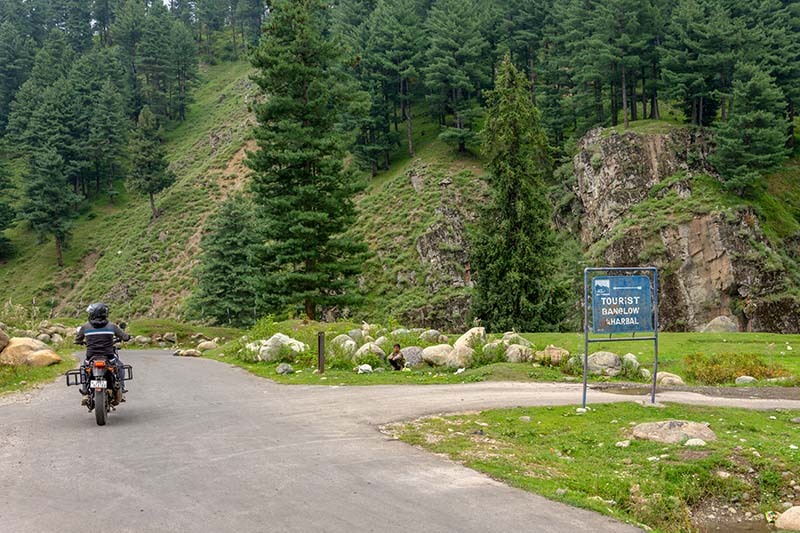 The entire stretch is a highly scenic drive crossing the high altitude pass of Peer ki Gali on the way. You can start early from Srinagar and also cover Mughal road on the same day while visiting Aharbal. The meadows of Kungawatan too are definitely worth visiting. There is no road to the meadows however and you will have to trek all the way. It actually lies at the halfway point of the two-day trek to the high-altitude Kausar Nag Lake. Please note though that visiting Kausar Nag Lake and Kungawatan meadows requires you to spend at least 3 – 4 days in Aharbal. The only place you can cover with Aharbal in a single day is only Mughal Road. Apart from spending some time in peace and enjoying the scenic beauty around; the other few activities that you can indulge in at Aharbal include photography, fishing and trekking to Kungawatan or Kausar Nag; horse riding and skiing during winter. There is plenty of Trout fish in the river so you can go fishing as well if that interests you. Please note though that you will have to obtain a permit for fishing; which you can get from the Fisheries department stationed at Aharbal. Accommodation is a bit of a problem at Aharbal. There are no luxury hotels here and your choice of stay is limited to just a J&K Tourism Bungalow where you can rent a room for Rs. 500 a day. When I was there last in 2018, the villagers were in the process of building some huts and guest houses close to the river but I am not sure how long that may take. To be honest though, unless you were interested in trekking to Kausar Nag lake; there is really no point in staying at Aharbal for the night. The place is great but just for a day. Make it a day’s trip and reach back to Srinagar by evening. There is really nothing else to do at Aharbal unless you do want to spend some time at a remote place in Kashmir in complete peace and silence. There are no cooking arrangements at J&K Tourism Bungalow so you will actually have to come to the village. There are several small hotels where you can easily get some basic food to eat; but do not expect something too great. There are no Banks or ATM here. The nearest one is at Shopian, 15 kilometers away. There is no gas station at Aharbal. The nearest one is at Shopian. You can however find a mechanic here for some minor fixes only. No hospital or medical shop here as well. The nearest medical assistance is either Shopian. For something serious however, you will have to rush to Srinagar. The first thing you need to remember is that only postpaid connections work in the state of J&K. Prepaid phones do not work here and will be dead the moment you enter the state. If you had a postpaid connection, then you will have full connectivity around Srinagar. As you start to get closer to Shopian and then Aharbal, only BSNL phones will have connectivity; rest of the networks will stop working. Aharbal is just a small village and shops here sell just some basic daily stuff. There is nothing special to buy here. Your shopping would have to happen in Srinagar only. The road is a single lane highway but is mostly in good condition. There are a few bad sections in between but nothing that may become too much of a problem. As I mentioned previously in the article, the road is mostly flat till Shopian and you won’t even feel like traveling through a hilly region. It is only after Shopian that you will gain some serious height in last 15 kilometers. Also Read: When is the Best time to Visit Gulmarg ? Aharbal is really a one day trip only. You can start early from Srinagar, say by 6 or 7 AM and reach Shopian. From Shopian, you will then travel to Aharbal, spend some time and journey back. Try to be back at Shopian by noon though. You will then have two choices; either travel on Mughal road all the way till Bafliaz or go halfway till Peer ki Gali and come back to Srinagar. Another thing you can do is to include Aharbal with a trip to Pahalgam. You can first go to Pahalgam, explore the areas there and cover Aharbal while traveling back to Srinagar. I hope the information above on visiting Aharbal Waterfall was of help. If you have any other questions; or need any further details; please feel free to ask in the comments section below; or at our Community Forum; and I will be glad to answer. Hello Vargis g. Ur blog on ladakh is still bookmarked in my collection. Now i found Kashmir. Ur infos r very helpful. THank u. Just need to ask u smthing. I am planning to cover aharbal on my return day from pahelgam to srinagar. on rout bat factory, aharbal falls, & awantipora temple. How long cud it take for the journey ? thx in advance. Hi Kousik – Pahalgam to Srinagar via Aharbal will take an entire day. Please make sure you get an early start from Pahalgam for this. There are so much details in your every articles which are very helpful, Thank you for helping us. Can you give me suggestion? Can i go to aharbal from pahalgam then go to srinagar?? if yes, what will be the cost? will it be a good decision?? Hi Faisal – Yes you can do that. A private taxi in Kashmir usually costs about Rs. 2000 to Rs. 2500 per day. No a friend of mine did who was there in October.